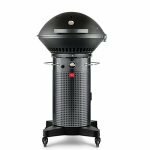 Gas grills are increasingly popular, and they are often the first step for entry-level grillers. Unfortunately, a really cheap gas grill has a relatively short lifespan. So, it can be hard to choose one with confidence in its quality. Char-Griller clearly put some thought into their design of the E3001 Pro. It’s priced to be at the top of the entry level grills, yet it has a lot of the quality you want to see in a mid-to-high end gas grill. It has two stainless steel propane burner elements, as well as a flip top burner in the left-hand side table. The burners are all ignited by a built-in electric igniter that runs on a single AA battery. The primary grill grate is made from cast iron for superior heat retention and searing. The grates also have a special porcelain coating, which gives them non-stick properties, as well as making for easy cleanup. This isn’t always the case with competitor grills in this price range. The sturdy base includes a special hole that is designed to snugly hold a propane tank. It also has two large heavy duty wheels which make it easy to move. There are also three tool hooks, which is something that gets overlooked with a lot of entry-level grill manufacturers. Char-Griller understands that when you plan to invest in a grill, that quality matters. They largely used heavy duty steel in the overall construction. The black powder coat is also durable and heavy duty. One small knock on the quality of the Char-Griller E3001 Pro is the lack of a heat deflector over the stainless steel burner elements. This increases the chances of flareups when you are grilling something like greasy burgers. It can also complicate the cleanup process if you are making something with some sloppy marinade. 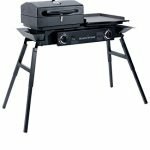 Gas grills inherently take longer to assemble than a basic charcoal grill. The Char-Griller E3001 Pro is a little more fiddly than others. Just make sure to fully tighten the front metal skirt, which is critical for tying the legs together for a fully sturdy base. If you have some basic mechanical skill and patience, you should be able to get it fully assembled in a little over two hours. If you prefer, there are online retailers who offer an affordable expert assembly service to take the hassle off your hands. For a grill at the top end of the entry level, the Char-Griller E3001 Pro will do most of what you want and expect it to do. All the basic stuff like hamburger patties, steaks, and chicken breasts are easy to prepare. The dual chimneys are a nice touch that goes beyond the visual appeal to help with internal heat control. The domed lid is also tall enough to handle tall pieces of food like the popular beer can chicken. There’s even enough space inside to handle two if not three broiler-fryers. The lack of a heat shield over the propane burners can be a little bit of a problem if you are grilling up a large number of greasy foods. You shouldn’t be surprised if you get a big flare up when you load it up with fatty burger patties. If this happens, you should close the chimney dampers and shut the lid to starve the flaring fat of oxygen. The two burners produce a staggering 14,000 BTUs of heat. This is considerably more than you will find with pretty much all of the Char-Griller E3001 Pro’s competitors. It also means that you can grill a pretty nice pizza on the grates or a preheated pizza stone. 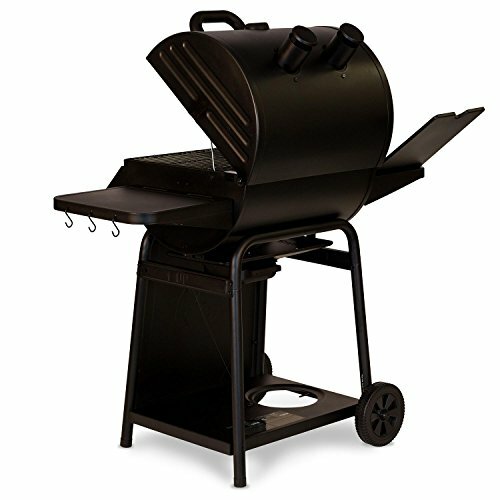 The Char-Griller E3001 Pro has a 438 square inch primary grill grate, as well as a 192 square inch warming rack. The 12,000 BTU side burner isn’t necessarily something that is going to knock your socks off. Yet it’s not something that you find with a lot of competitor grills in this class. The Char-Griller E3001 Pro has some pros and cons when it comes to clean up. The non-stick porcelain coating on the cast iron grill grates makes them very easy to scrape down. If something like a little caramelized marinade gets trapped in the corners, you can always pull the grates off to wash them with soapy water. The porcelain coating will prevent the water from causing any rust or corrosion. The drip pan on the Char-Griller E3001 Pro is also on the large side. It’s easy to pull out and pour off. The lack of a heat shield over the propane burner elements can be a bit of a cleanup issue. It can lead to flareup issues, as well as problems with things like burned on marinade plugging up a flame port. If you need to release something from the burner, you should use a nylon bristled grill brush. A clogged flame port can be cleared with a bamboo grilling skewer. 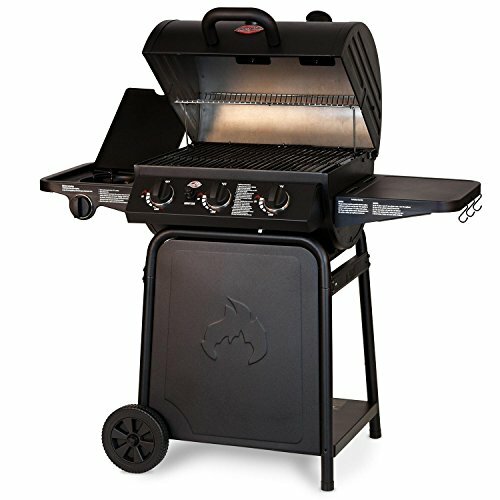 The Char-Griller E3001 Pro has a 5-year burn and rust-through warranty is among the best in the grill industry. 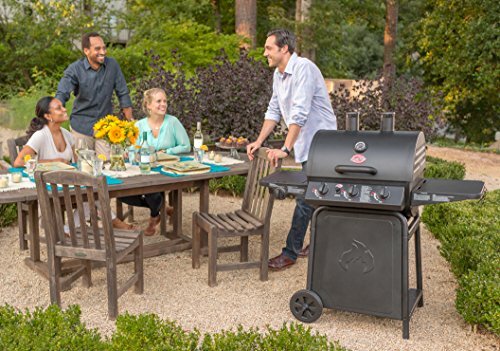 Most grill brands stand behind their products for 1-year. There are also online retailers who offer two-and-three year protection plans, which can help cover any other component concerns. 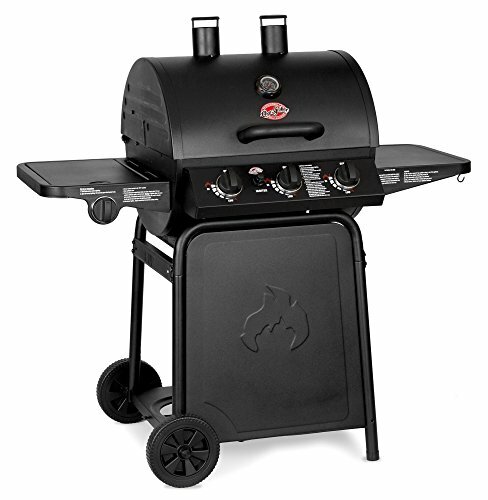 If you are looking for the top of the entry level grills, you have to keep the Char-Griller E3001 Pro on the top of your list. It’s got all the features you want, along with impressive high heat capacity. 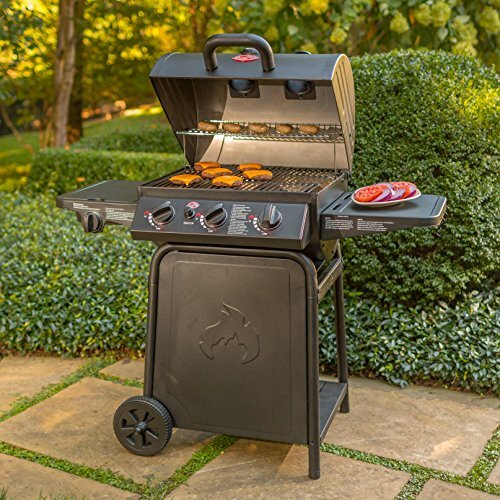 Not to mention the fact that Char-Griller stands behind their product with an impressive best-in-class warranty. Just watch out for flareups when you grill up a large volume of fatty foods. Being mindful of excess marinade when you lay a piece of meat down will also help with the cleanup process.